All-American Boy | Veteran and warrior Carl Quaney has never shied away from jobs that require toughness. As a Marine, he patrolled hostile combat zones in Iraq, where his life was compromised daily. 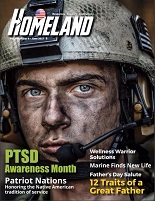 In the June issue of Homeland Magazine, Wounded Warrior Project® National Service Director John Roberts details Carl’s story of honor and empowerment in the journey to civilian life.